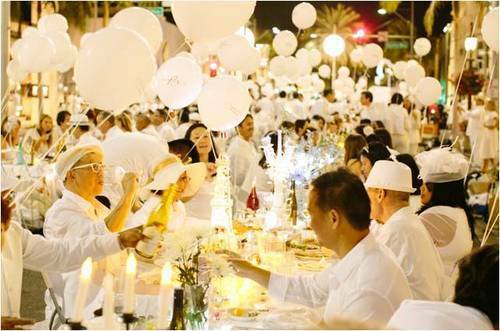 Le Diner En Blanc…A chic, elegant Parisian picnic party that takes a flash mob of Foodies to a secret picnic location in their hometown. 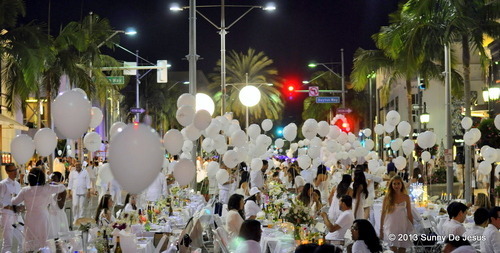 I was a part of the attendees along with a big group of my friends who took over Rodeo Drive one evening. It seemed strange to sign-up for a food and wine event where you have to bring your own table, chairs, food and drinks. It seemed just as strange to board a bus somewhere in Los Angeles and meet with a couple thousand people that you don’t know at the secret location. The uncertainty of this dining flash mob was a bit nerve racking, but I’ve always been one for culture and adventure. Well, it turned out to be an enchanting evening of good food, great wine, energizing music, and dancing. 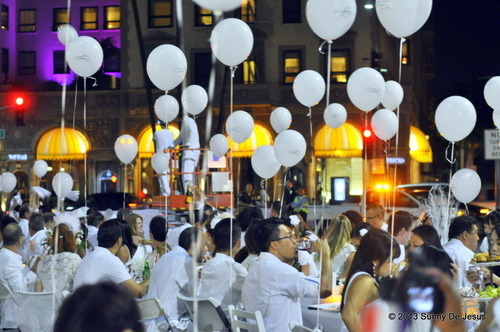 It was a lot more fun to be at the inaugural event of Le Diner En Blanc in the Los Angeles area with the company of all my friends. Thank you to LAist for capturing this photo of us….